Stardate 12611.8 USS Tahoe will soon depart for Las Vegas on an exploration and diplomatic mission. What has changed since my last encounter with the natives in late 1999? Stardate 12610.5. USS Tahoe, pre-departure systems check for launch at --2.0. Destination: Delta Vega through the M'hve Nebula. 100 strips of latinum to fill up! Too bad ST:The Experience isn't there anymore. 6:30 sun up over Bakersfield with an ETA of 12613.4 noon check-in. Not pulling over to the right immediately (he was half a mile behind us! ), could have been detained. Let go with strict warnings on #s 2&3, priceless! You know that you are in "Sin City" when there are no Gideon Bibles in the rooms. In Las Vegas. Either you walk with God, or you're doing this. Dinner with Sharon at Henderson, half-way to the Grand Canyon, Arizona border. We walked from Caesar'$ Forum at1pm to the Miracle Mile Shops for a lot of shopping. We then crossed the Blvd to walk around the main level of New York New York but not the roller coaster. It is a lot of food places matching the diversity of the ethnic neighborhoods of New York. around Venetian and its interior forum, to the streetside of Treasure Island. Angie w/ Paul hooked up with Lana straight on 'til morning. I stayed up late nights to watch movies on HBO and Red Box. Star Trek the Voyage Home and The Ubdiscovered Country I enjoyed again. As well as The Expendables and the last 10 minutes of Cat People. Luxor has the same interior I remember from eleven years ago. 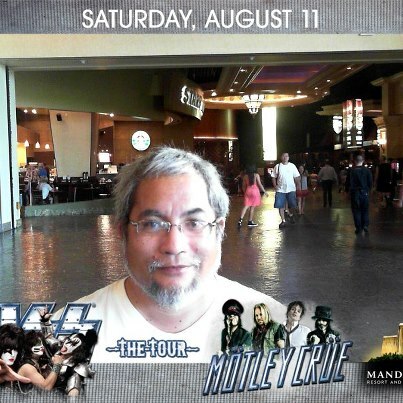 The view of the Mandalay Bay beach is where I had my picture posted at the FB kiosk. -$ 89 Shark Reef at 4:30 for our group. It was worth it. A quick walk through to the Excalibur, to New York New York neighborhoods of restaurants, we searched for a decent place to eat. (they're not cheap). We then walked around the Crystal and Aria, to end up at the other half of the Miracle Mile Stores. At 8pm, we saw the five minute Bellagio fountain show. as we waited for Angie to pick us up. Paul treated us to dinner at Miller's Ale House where I had the pictured seafood platter. Breakfast w/ Gene "Osong" at Seafood City (yes I still eat filipino food). We checked out 11am, and left after picking up Lana. Coincidentally, Osong lives in the same compound of townhouses. There was an exit to Boron CA. Which brought to mind "Death Valley Days" and the Borax label "20 Mule Team" brand of soap. By 4pm we were in Barstow Station. The large McD has Telsa car charger parking spaces. Actually, this was Monday, the 13th of August. Before going to the Shark Tank at Mandalay Bay.